For my birthday, my awesome mother got me this awesome tool. I went out and took some pictures of it yesterday, and I decided to post a review on it today. The tool in question is a DeWit Half Moon Hand Hoe. I love DeWit tools, and there's not much else to it. I've visited their factory (who does that???) 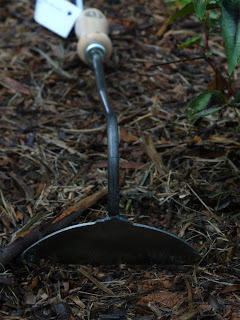 and have an assortment of their stuff, but this handhoe is probaby my new favorite. It's well-balanced with a long neck. I'm pretty clumsy and have terrible visio-spatial skills, but I can wield this hoe like an extension of my arm. That's quite an excellent thing when you're not interested in crawling through expansive beds that can't really be compressed without damaging the plants. With this lovely, I'm able to sit on my stool and hack away. The small head makes it ideal for whacking around in between plants. For those of us who have limited mobility, it's an even sweeter deal, since not having to squat or kneel can mean actually being able move the day after a rigorous gardening session. When the blade starts to lose its impressive edge, you're able to regrind and sharpen it without voiding the product guarantee/warantee. What else is going on in my little world? MORE RAIN! The Weather Channel says that we've gotten only 1.5", but there's been an 8" increase in my collection pans -- without the funnel on. It looks like we're going to get more rain tomorrow, but I'd be very thankful if we got a couple of days to dry out so everything doesn't rot. Please? Also, I got a little plug for my other shop, fluffnfixings, here.